STILLWATER, Okla. (AP) — For No. 13 Oklahoma State, just getting back on the practice field Friday and having another opponent to focus on was therapeutic. After falling to No. 11 Oklahoma a week earlier in a game that slipped away in the final 19 seconds and cost them the Big 12 championship, the Cowboys (10-2, 7-2 Big 12) are trying to move forward and get ready for the AT&T Cotton Bowl Classic in Arlington, Texas, on Jan. 3 against No. 9 Missouri (11-2, 7-1 SEC). Senior quarterback Clint Chelf, who completed 19 of 25 passes for a career-high 370 yards and three touchdowns in Oklahoma State’s dominating 49-17 win over then-No. 3 Baylor on Nov. 23, but was merely OK against Oklahoma, admitted that the mood in the locker room was still a bit somber. Senior fullback Kye Staley wanted to erase the Oklahoma game from his memory and direct all of his attention toward the bowl game. “It was an upsetting loss but we can’t dwell on it. It’s the past,” said Staley, who rushed for 25 yards and two touchdowns on seven carries against Baylor but only got the ball once, for no gain, against OU. 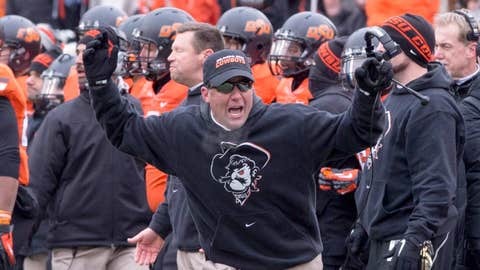 Gundy viewed the disappointing defeat as a life lesson he can impart on his players. The Cowboys are excited about the matchup with Missouri, which also lost its last game in disappointing fashion, falling 59-42 to No. 2 Auburn in the SEC Championship Game. With three weeks to go before taking the field at AT&T Stadium under the giant video board, the players will have to adjust to a different game preparation routine than they’re used to. Staley looked at the extra time as being important to getting ready both physically and mentally.